For years, I wandered through the wilderness of trying to learn jazz guitar. Trying to make sense of how everything fits together. Running down endless rabbit holes. Seeking out expert jazz guitarists for guidance, but getting frustrated that they couldn’t relate what they knew into a way that made sense. I got so frustrated with not being able to improve my jazz guitar playing, I gave it away – for about ten years. Again and again, I started getting offers for lucrative gigs and exciting performance opportunities, and I just couldn’t ignore the jazz itch any longer. I needed to find a way that I could improve my jazz guitar skills, and do it quickly. The way jazz guitar is usually taught (in terms of scales, modes, and arpeggio patterns) is completely flawed – because it’s missing out the vital elements you need in order to sound like a jazz player. So I started to design my own system to improve my jazz guitar skills, based on observations of how masters like Joe Pass and Wes Montgomery approached the guitar, with some Eastern philosophy I’d studied over the years thrown in for good measure. In the process, I stumbled onto one of the most important things you need to do to get your playing sounding like a true jazz musician. Because it’s so simple, it’s an easy (but critical) mistake to make if you don’t do this. Learn a whole heap of jazz standards. This is one of the best tips I can ever give you. If you want a solo melodically and sound like a jazz player you need to, as Joe Pass puts it, ‘learn as many melodies as you can’. By regularly learning new tunes, it’s only a matter of time before it will profoundly impact your playing – and you’ll begin to sound like a true jazz musician. 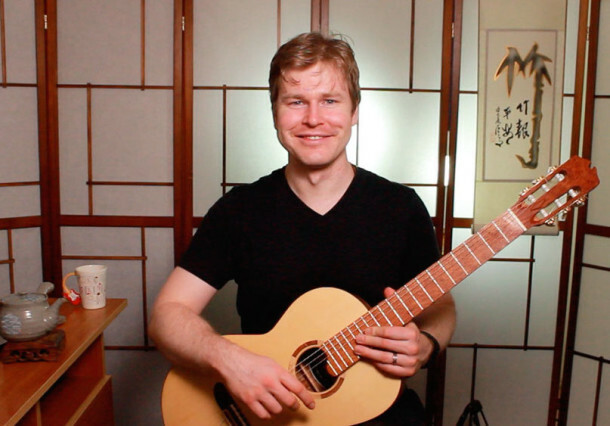 My new program, The FretDojo Academy Club, is the perfect answer to building your jazz set list on guitar in an easy, step-by-step way. In a nutshell, it provides you a new ‘jazz standard in a box’ to learn every single month, delivered to your (virtual) door. You’ll get all the ingredients you need for preparing a convincing jazz guitar performance of each new tune featured. Melody, soloing, comping, chord melody – the works. This month, we’re going to cover the classic standard All The Things You Are – one of the most played jazz standards you’ll hear at gigs and jam sessions. Isn’t it time that you stopped hiding away in your bedroom, getting frustrated and going around in circles – and instead show your family and friends that, yes, you CAN play jazz guitar – and wow them with a great rendition of All The Things You Are? If you join the FretDojo Academy Club today, you’ll get a whopping 69% discount. (To get the discount, just enter coupon code ‘CLUB69’ at checkout).